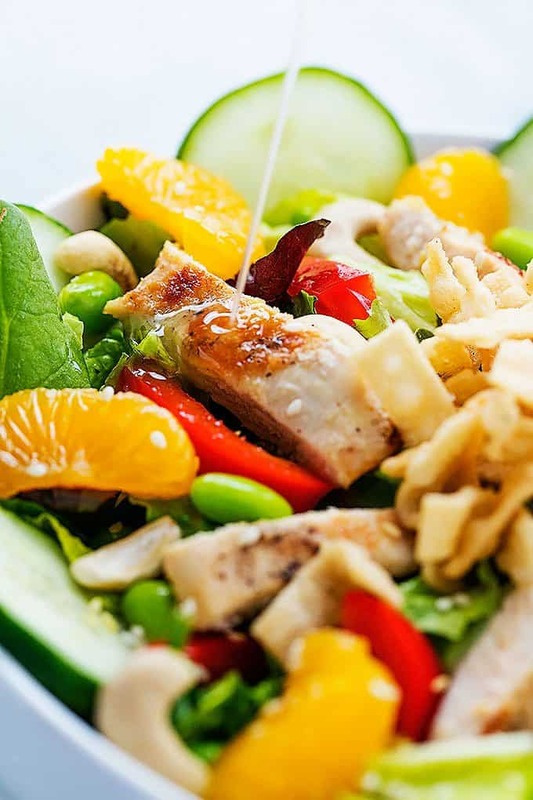 A healthy and hearty fresh Asian Citrus Chicken Salad with cucumbers, edamame, juicy mandarin oranges, crispy wonton strips, cashews, and a quick sesame ginger dressing! Oh this salad…. this salad is yumtown people and I’m taking up permanent residence here in this Asian citrus chicken salad place. 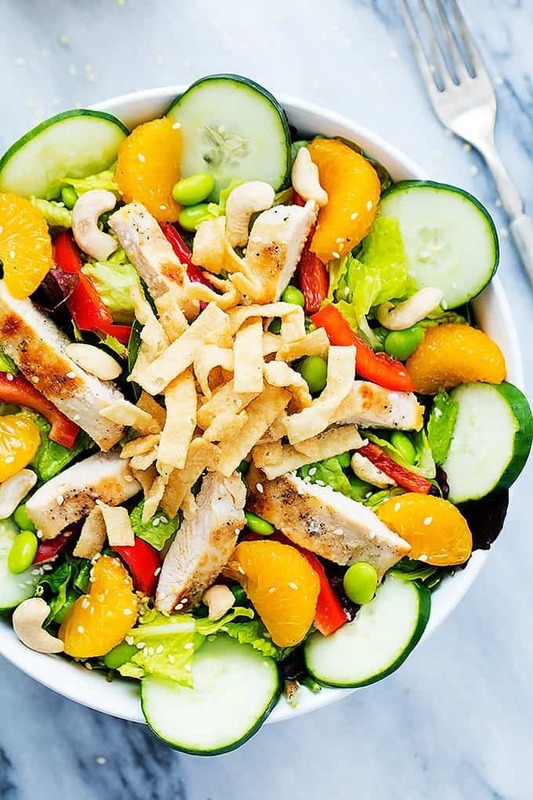 Because anywhere that a pile of greens meets cucumbers + red peppers + edamame + oranges + crispy wonton strips + cashews and a sweet and zippy (yes, zippy.) sesame ginger dressing is somewhere I need to be. Like always. I really love trying out new restaurants, but what I love even more is putting a new restaurant on our must-visit-on-a-regular-basis list. That is a good list. One filled with restaurants where good food has been had and great memories have been made. Zupas is somewhere near the top of that list. My earliest memories of Zupas Cafe go back to my first college days when my pops and I would get season tickets to the BYU football games. We’d eat at Zupas, head to the pre-game festivities, and then settle into our seats and get geared up to yell our lungs out for the next several hours. Ahhhhhh good times, good times. 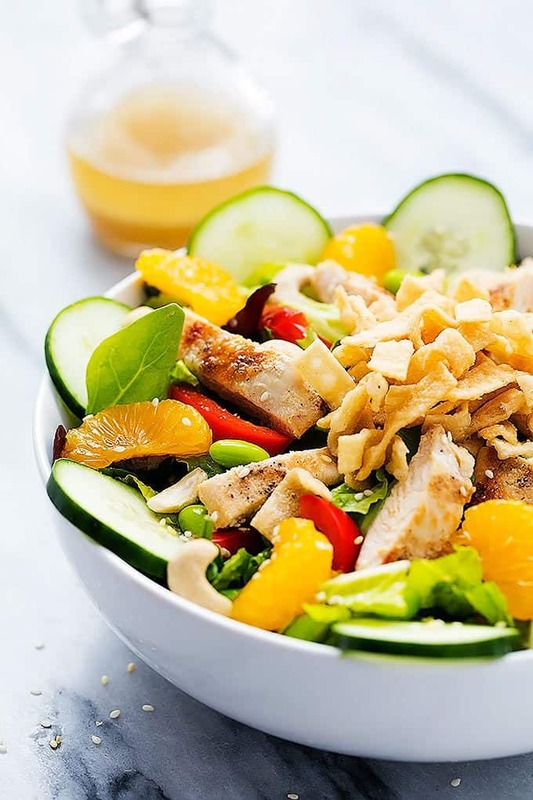 Annnnyway, one of the salads on Zupas menus is the Asian Citrus Chicken Salad and it pretty much looks exactly like what you’re seeing in these pictures. The only difference here is the dressing. Their salad is topped with a miso vinaigrette or something and because I tend to lean toward creating recipes that use ingredients that almost anyone has on hand or can get very easily, I ditched the miso thing and went with a quick sesame ginger number. And oh, it is good. Perfectly sweet and zippy, (as previously mentioned, “zippy” is a thing) and a cinch to make. Also, today felt extremely spring-ish around here so I’m thinking this salad couldn’t be coming at a better time. Bring on the spriiiiiiing. 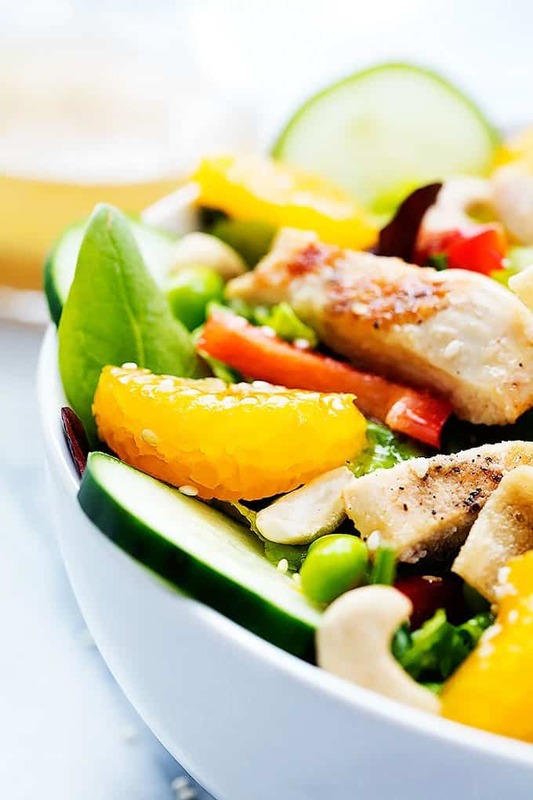 A healthy and hearty fresh spring salad with chicken, cucumbers, edamame, juicy mandarin oranges, crispy wonton strips, cashews, and a quick sesame ginger dressing! Whisk together all dressing ingredients and set aside. Season chicken on both sides with salt and pepper to taste. Cook in a greased skillet over medium heat for 5-6 minutes on each side or until cooked through. Remove from heat and allow to rest for 5 minutes before slicing into strips. 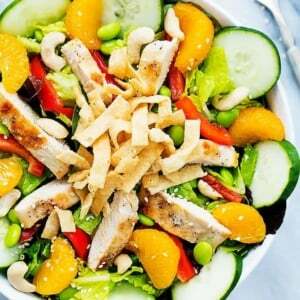 Toss together the lettuce, red peppers, edamame, mandarin oranges, and cucumbers and divide between 4 plates. Top each with an equal serving of chicken. Top with wonton strips and cashews and drizzle with dressing. If desired, sprinkle with sesame seeds before serving. I’ve been trying to spice up my salad routine lately and this salad sounds so good! Love the combination of sweet and savory! I hope you love it Quin! I really love the flavor combinations in this salad – so much going on yet it’s so simple to make! Love your blog! My name is Robert and I represent Wolfcastelle.com. We are an up and coming brand that specializes in high end products that simplify your life. Since you have such amazing posts, we would enjoy having you write a short post or short video about our Wolfcastelle herb grinder. In exchange we will provide you with a free herb grinder that it shipped directly from Amazon. I made this for dinner a couple of nights ago, and my husband said it was the best salad i’d made in a while! This salad is definitely a keeper.